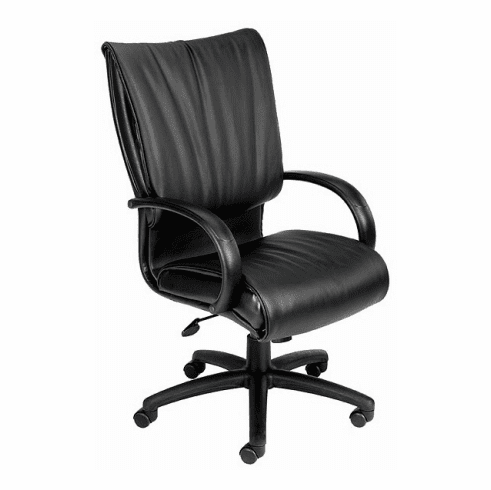 Boss High Back LeatherPlus™ Office Chair [B9701] Free Shipping! This executive high back office chair features soft top grain leather upholstery on the seat and back cushions and durable, matching vinyl trim. Other features include thickly padded Dacron filled cushions, comfortable nylon loop armrests, adjustable tilt tension control, pneumatic gas lift seat height adjustment, 360° swivel and a large 27" nylon base with hooded, dual wheel casters. Dimensions: Seat size: 20"W x 20"D. Back size: 22"W x 26"H. Seat height adjustment: 18.5-22.5"H. Fully warranted by Boss Office Products. These high back leather office chairs normally ship within 2 business days from our GA or CA warehouse.